The Laminitis Site has helped hundreds of horses to recover from laminitis, all around the world. Some of these are hands-on rehabilitations at or local to The Laminitis Site, but most are helped through the Friends of The Laminitis Site support group (previously the EMS, PPID and Laminitis UK Group). 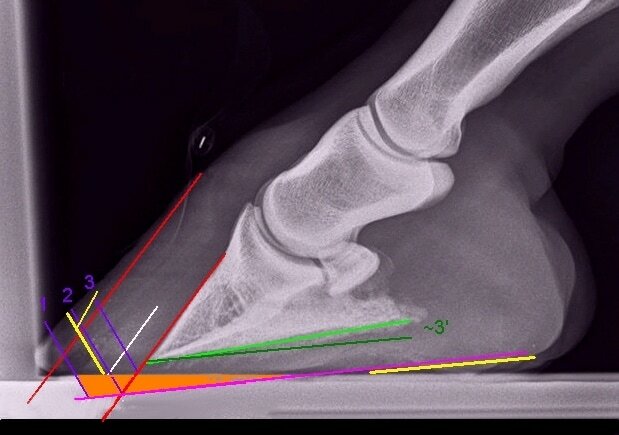 The Laminitis Site made suggestions for a realigning trim after x-rays showed that Deb's horse Buttons had rotation and was close to solar penetration on both front feet. "The Laminitis Site has been fantastic helping me with Buttons as she recovers from laminitis. The advice and support they give is evidence-based and they have a great deal of experience in rehabilitating horses with laminitis, Equine Metabolic Syndrome (EMS), Insulin Dysregulation (ID) and Pituitary Pars Intermedia Dysfunction (PPID). I can't recommend them highly enough to anyone who is managing a horse with any of these conditions."